Colour does not always prove the quality of oil. Good oil can be from green to golden yellow. As colour is not a sure sign of quality, experts test olive oil in dark and not transparent glasses. 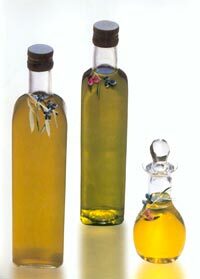 The colour of the product depends on the main substances of the olive fruit that the oil has been made from. If chlorophyll is the main factor, then the oil will lean more towards the colour green. If carotene is the main substance, then the oil will be more golden yellow. Olives which are gathered at the beginning of the harvesting period usually produce oil of a greener colour while oil produced from ripe olives tends to be more golden yellow due to the carotene they contain. Olive oil reminiscent of the scent either of fruit or of oil fresh from pressing is believed to be excellent. Testers try to pinpoint pleasant smells which remind them of another product, such as fruit, like apples or nuts etc. A bitter or slightly bitter taste shows that the olives used where not ripe when picked. A pleasant smell and taste can also be put down to the area in which the olives grew and they way they were cultivated. The degree of acidity in olive oil indicates the oleic acid content. Methods of harvesting, storage and pressing can affect the level of acidity. The degree of acidity in oleic acid indicates the oleic acid content. The degree of acidity greatly affects the taste. Olive Oil with a higher level of acidity makes its presence known on first tasting it as it has a pungent spicy unpleasant taste. Methods of harvesting, storage and pressing can affect de level of acidity. Oxidization (rancidity) is one of the most important causes of spoiling olive oil Conditions of storage like light, oxygen etc help oxidization. This is easily spotted by a tester without scientific tests, as the taste is badly affected by oxidization.